Today, President James O’Brien testified in support of the Machinists Union, Local 264, at the MBTA’s Fiscal and Management Control Board (FMCB) meeting. Below is his testimony. Last year, it was our Union, our 4,100 members, fighting against privatization to save our jobs and do what we think is in the best interest of the MBTA―which is Keeping Public Transportation Public. After months of conversations, and ultimately negotiations, we were able to come to an agreement with MBTA management that not only preserved the jobs of our members―it identified $750 million in cost savings and efficiencies for the MBTA over the next twenty years. 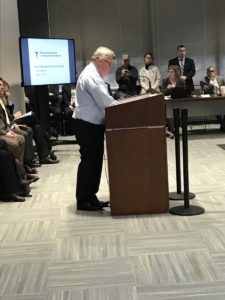 It was our hope that our contract negotiations would serve as a roadmap for the MBTA going forward, that management would realize you do not need privatization in order to find cost savings. Our agreement is proof of that. The Union members you identify as replaceable are, in fact, an integral part of the MBTA. The employees are the MBTA, they are dedicated to their work, and understand the intricacies of this complicated system better than any private company ever will. I stand here to remind you that there are other options – and privatization should be the last resort, not the first option put on the table. For months we have listened to various consultants talk about why work should be privatized – and many have pointed to privatization of the money room and warehouse as examples of privatization at work. But, it’s just not that easy. Our members are regularly reporting problems in these divisions – privatization is not a silver bullet and it should not be treated that way. It is too early to determine if privatization is going to provide the cost savings that were promised. If Keolis is the standard―it doesn’t look good. The Boston Carmen’s Union is proud that we were able to reach an agreement with the MBTA that protected our member’s jobs, and helped the MBTA identify cost savings it needed, but make no mistake about it―we are against privatization of MBTA jobs because we don’t believe it is in the best interest of our brothers and sisters―or the MBTA and our riders. In closing, I want to let you know what I have been hearing from our members in recent weeks. They have expressed real fear about the possibility of the machinists’ work being privatized. The men and women driving and operating our buses, trolleys, and trains don’t want private contractors coming in and doing this work – because they can’t trust them. They fear for their own safety, and the safety of our riders, not knowing if the people who come in can do the job, and do it well. The Boston Carmen’s Union stands with The Machinists, Local 264 because we know they are the best prepared, the most knowledgeable, and the most capable―and it’s who we trust to get the job done.